The SOS is held in South Wing Hall C, which is the first portion of the Expo Center that you seen when you drive in the main gate. Zoom in on the map for this detail. Enter the KEC grounds through the main gate, proceed past the parking fee collectors (after having paid them $8), and the first big curved glass exhibit hall that you see is the SOS. Look for the big Show-of-Shows banner over the entrance. 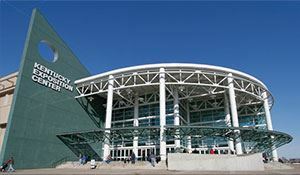 The expo center is less than a mile from Louisville International Airport (SDF), and is easily reached from Interstate 264 or 65.